In American culture there is no meat more revered than steak. We're going to help you plan the perfect romantic Valentine's Day dinner with the perfect piece of steak. We're going to give you no fail cooking guidelines whether you're grilling or broiling your steaks. We also have recipes for steak sauces sure to please. When you're shopping for steak in your local supermarket always look for Prime or Choice grades. Prime is better. However, keep in mind that steaks get their flavor from the marbling of fat within them. A steak that is very lean will not have as much flavor as a steak that is marbled. You want to look for even thin strands of fat throughout the steak. Everyone has heard of a Filet Mignon. Filet Mignon tend to be the most tender of steaks, but they're the leanest cut too. Due to the fact that they're extremely lean they are generally not the most flavorful. Most steak aficionados will say that Porterhouse steaks are the best. 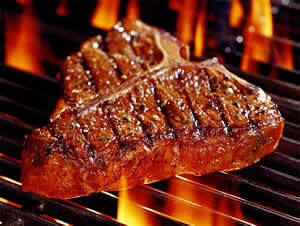 A Porterhouse steak is a combination of the top loin, which is very flavorful, and the tenderloin, which is very soft. The butcher should be able to answer any questions you have. Let's say you've chosen every man's favorite steak, the Porterhouse, for your romantic Valentine's Day dinner, now you need to cook it perfectly. I've used this guideline for years every time we've cooked a steak (of any kind) and they turn out perfectly. Divide the time in half for each side. Certainly there are times when you cannot grill and you must broil your steak. Broiling is like grilling, except the heat source comes from the top instead of the bottom. Please check out these tips for broiling and time guidelines for broiling steaks from the Iowa Steak Industry. Try out this amazing Balsamic Steak Sauce courtesy of Giada DeLaurentiis. It ss truly one of the best sauces I have ever had on a steak. It's rich, and super simple to make. Check out a Bernaise Sauce recipe courtesy of Fine Cooking Magazine. This Bernaise Sauce has got to be one of the best loved steak sauces. Once you've had a Bernaise Sauce you'll never forget it. It can be challenging to cook, as you have to avoid curdling and separation. It's a very special sauce and your Valentine is sure to be appreciative of your efforts! Here is the best steak sauce recipe you'll find anywhere - Original Henry Bain Sauce. Simple to make and delicious, the perfect blend of sweet and spicy to enhance the flavor of your steak.